Cynthia Bertram has been battling with serious health issues for several years. Help Hope Live, to help with the transplant-related medical expenses Cindy will face. Cindy’s life has been a shining example of service, compassion, and love for others. handicapped son born with Fragile X Syndrome. A true caregiver at heart, her dedication to family has been unmatched. Throughout her husband’s military career, she tirelessly supported her husband and cared for their son, while also helping fellow Marine Corps wives and their children during those long deployments. Additionally, Cindy has readily volunteered to help others in need, especially the elderly. She regularly gives of her time to provide hands-on assistance with the daily needs of those living with Alzheimer’s disease – providing transportation and help with shopping, etc. Cindy has sacrificed so much to support her immediate family, her extended family of all who have served our nation, and her local senior community. Now she needs that same kind of love and commitment that she has given so freely to others. In recent years, Cindy’s health has declined. In September 2016, she had to have 16 units of blood and 6 units of platelets due to internal bleeding caused by Cirrhosis of the liver. Although she has never been a drinker of alcohol and has never used drugs, she unknowingly contracted Hepatitis C at some time in the past. Now a liver transplant is unavoidable. Cindy has Medicaid, many related expenses are not covered, such as monthly anti-rejection medications she will need to take for the rest of her life. She has been told to anticipate a financial responsibility upwards of $5,000 per month just for prescriptions alone. We’re asking family and friends to join us in fundraising for the nonprofit Help Hope Live to help Cindy with critical transplant-related needs. Donations to Help Hope Live can help ease the financial burden of a transplant, thus allowing Cindy to have a healthy recovery and continue to care for her beloved family and others, as well as herself. Make a donation right now by visiting helphopelive.org and searching for Cynthia Bertram or by calling 800.642.8399. Donations are tax deductible to the extent allowed by law, and all funds raised will be used to offset medical expenses as part of the Help Hope Live Southeast Transplant Fund. fundraising campaigns for people who need a transplant or are affected by a catastrophic injury or illness. Since 1983, campaigns organized by Help Hope Live have raised over $131 million to pay patient expenses. Donations made in honor of a specific individual, or in response to campaign solicitations, are restricted by region only and do not obligate Help Hope Live to allocate funds towards a specific individual, as the IRS would deem such donations to be private gifts, which are not tax deductible. Clients receive support according to their medical and financial need. Help Hope Live is a 501(c)3 nonprofit. Information: 800.642.8399. 11/08/2018 Went to USA Medical Center for 2d Right Heart Cath due to requirements of UAB Liver Transplant Center in Birmingham, Al. While listed for Transplant and taking the Medicine Vetetri for Pulmonary Arterial Hypertension, a patient has to have a Pulomonary Pressure no greater than 35. At the 1st Right Heart Cath in January 2018 my pressures were 78 so I was prescribed Veletri which is an intravenous administered medicine that is administered through an IV implanted in my Right Chest above the Brest. This medicine has a very short life span of only 3 to 5 minutes so it is administered daily through the use of the IV line and a 100ml cassette that is filled with the medicine after mixing the dry powder vials with styrle water in a given procedure. See the video demonstration my Husband Tony made and uploaded to www.youtube.com . This is my 3rd Right Heart Cath and the pressures are down to 30 so I will remain listed for a Liver Transplant. I have been on the list for 6 months now and praying I am getting close to a Donor being found that is suitable for my Blood Type, Height and Weight. My Physician has determined that a partial Donor would not work for me so the Liver will have to come from Someone who decided to be a giver of Life when they die. I am saddened that another person dies but glad that there are people who are willing to have organs donated so that others may live. They are Angels and many would not be here today without their Generosity. 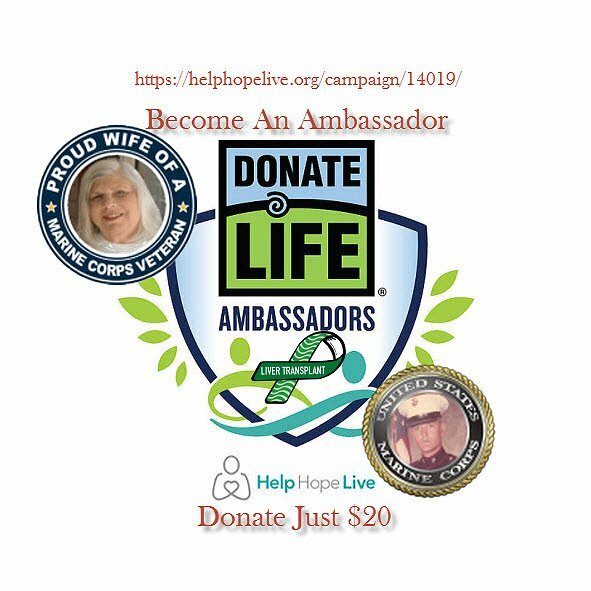 So I am asking the Living to be just as Generous and Donate to HelpHopeLive so that I and others may have the Hope of getting Help so that we may continue to Live. Thank you in advanced for you kind Hearts. Had to take Cindy to the USA Medical Center ER this past Monday the 23rd of April 2018. Had Chest pains and sharp pains under her right rib cage. The Chest Pain turned out to be caused from the Pain under her Ribs, Docs think it was her Liver reacting to the Medicines she is on to open up her Blood Veins and Arteries. A Right Heart Cath was done and the Pressures in the Pulmonary Artery has dropped to 30 which is good. Means the Medicines Veletri is working and doing what it is supposed to do. Could be her Liver trying to process that new Blood flow through it but due to the scarring, the Liver just can not handle it. Will update her page as I can. Thanks to those who have contributed to Help Hope Live, it enables all Transplant Patients to receive the help with High Cost. Sending prayers for you both. Godspeed to you in your recovery. Please thank The Lord and not me. I am merely a vessel of his will. Whatever it takes! We're gonna git er done! Love and prayers, always. Cindy & Tony, You're always in my thoughts and prayers. We shall overcome! OORAH! We got this, Cindy! God said so. Yours and Tony's journey has been long and hard. Your courage and strength is an example to those of us who have hurdles of our own to overcome. Continue to persevere, continue to shine. Never give up! Always in my heart and prayers.